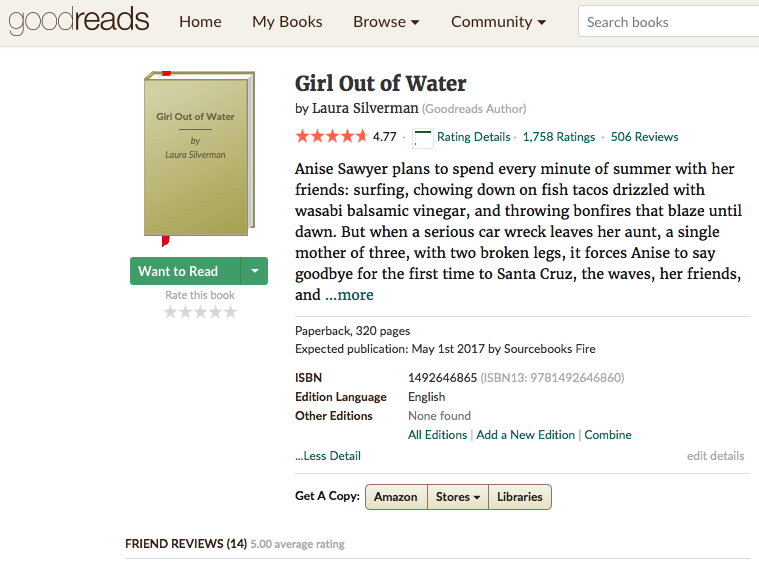 Laura's book, Girl Out Of Water (May 2017, Sourcebooks Fire) isn't out yet. The review copies aren't out yet. 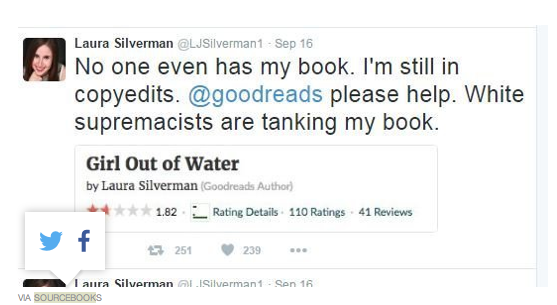 But suddenly the book's goodreads account had more than 1,500 ratings of the book. The book that almost NONE OF THEM, unless they were personal friends with the author, could have possibly read. And then many people (including some famous authors) added their supportive 5-star reviews. As of this writing, the book's goodreads page had over 1,750 ratings and 506 reviews. And a 4.77 rating. The Huffington Post article stated that according to Kathryn Lynch, a publicist at Sourcebooks, "Goodreads was able to remove the troll reviews and ratings by early this week." 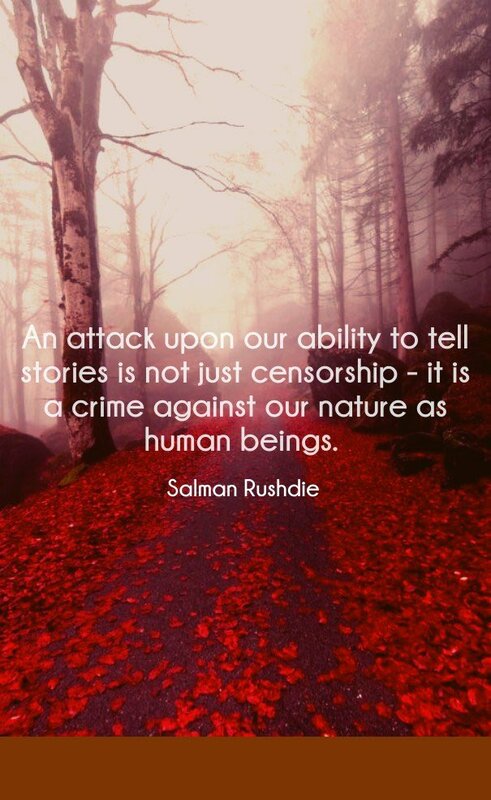 Is this the new battleground for censorship? And is the response by a community trying to support an author under attack by adding their own 5-star reviews diluting the whole purpose of a community-based book review site? 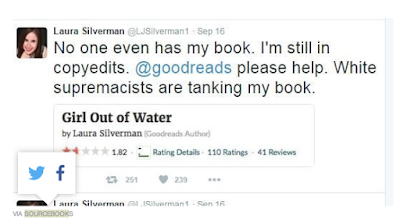 Is the real culprit the anonymous element, that people can create goodreads accounts not tied to their actual identities, and do so just to attack people like Laura? I don't profess to have all the answers. But as we observe #BannedBooksWeek and celebrate the freedom to read, it's clear that these questions are something our community needs to engage with. ps - Goodreads did not respond to a request for comment. How Are You Celebrating The Freedom To Read -- also known as Banned Books Week ? The official Banned Books Week site is here, and it's packed with great stuff. fREADom is really clever - thanks, Katey! The shift seems to be linked to demographic changes in the country—and the political fear-mongering that can accompany those changes, LaRue says. “There’s a sense that a previous majority of white Anglo-Saxon Protestants are kind of moving into a minority, and there’s this lashing out to say, ‘Can we just please make things the way that they used to be?’” LaRue says. “We don’t get many challenges by diverse people,” he adds. 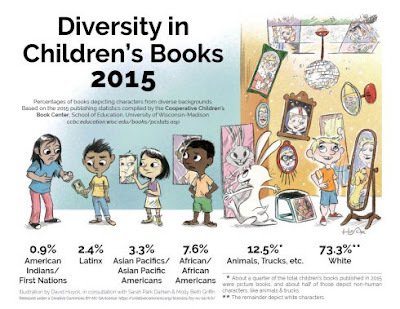 It's an observation echoed in Maggie Jacoby's article Why Diverse Books Are Commonly Banned. How will you celebrate your freedom to read this week? SCBWI is just bursting with great information to share. 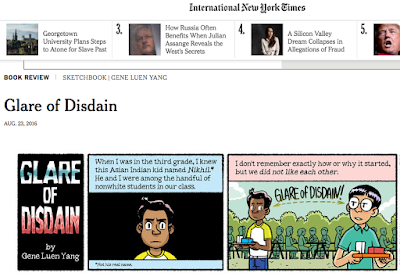 It's a really interesting recap, and I especially love how Paul describes the feeling he wants his illustrations to convey. Like for his "The Wheels On The Bus"
"It’s a jumpy song, bright and happy. The feeling that I wanted visually was not just colourful but also ‘chewy’ like bubblegum. The pictures should be something that you could want to chew on and they’d be sweet when you ate them. The song is bouncy. [So I went with] oil paint with a certain amount of thickness. The act of pushing oil paint across the page felt sort of like the feeling of singing the song." Q: We have a lot of people who are just starting out in their Illustrator career - what’s pearls of wisdom could you provide? Paul notes that this is just from his experience and not the only way. I would encourage people to not limit your artistic vision to illustration, but think about the whole world of other kinds of art and everything. There are a lot of trends that happen in illustration… and if you look only at children's books then it’s limiting…and that’s just me because I didn’t study illustration. I go to figure drawing and draw from the figure once a week if I can. Drawing from life is a great thing and is good for training. In terms of ways that you can make images, I just look at different things. And copy Art. It’s amazing what you can learn if you just start copying it. Writers as an exercise will retype someone else’s story and the act of putting down someone’s words will give you insights. Drawing from life is similar to copying from art. It teaches you to see more things then you would otherwise see. Great stuff! 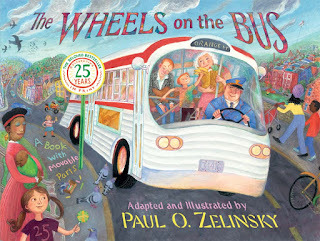 Thank you Paul, and thank you SCBWI Australia East and New Zealand! 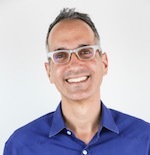 You can find out more about Paul here. And more about SCBWI Australia East and New Zealand here. 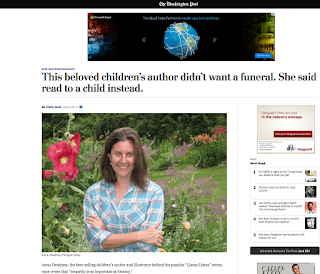 She requested that in lieu of a funeral service that people read to a child instead. That's a beautiful legacy. Go do it, now. And after you've read to a young person in your life, take a moment and read this powerful piece Anna wrote a few years ago that was published in the Wall Street Journal, How Books Can Teach Your Child To Care, on how reading builds not just empathy, but human beings. When we read with a child, we are doing so much more than teaching him to read or instilling in her a love of language. We are doing something that I believe is just as powerful, and it is something that we are losing as a culture: by reading with a child, we are teaching that child to be human. When we open a book, and share our voice and imagination with a child, that child learns to see the world through someone else’s eyes. I will go further and say that that child then learns to feel the world more deeply, becoming more aware of himself and others in a way that he simply cannot experience except in our laps, or in our classrooms, or in our reading circles. Read all about this great infographic, the data behind it, and the team that made it happen here. 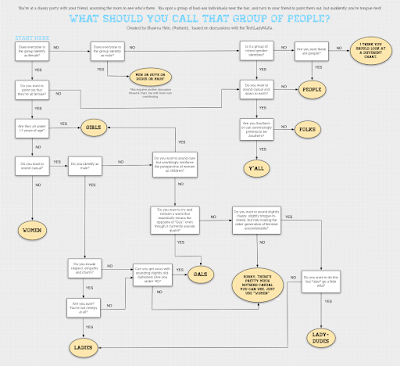 A group of men can be 'guys,' but what do you call a group of women? 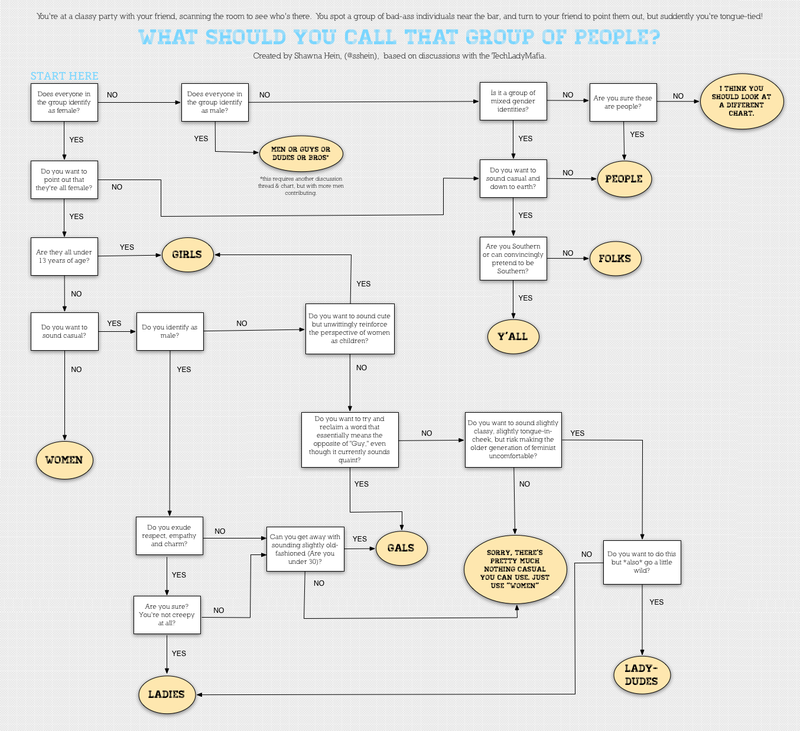 The piece also includes this extremely useful - and very funny - infographic by Shawna Hein. Continue to choose your words carefully! As we move into the future, Brian's point about non-linear information in books is striking... I don't really use my printed dictionary anymore, either. Maybe the future of print is more about storytelling, and the book as a special object. I'm not sure. But it will be fascinating to see what evolves. And Brian's art is fascinating as well. 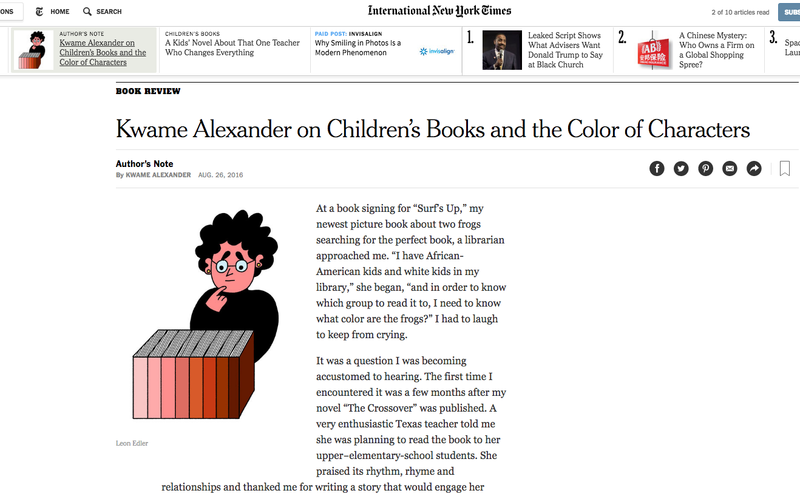 Read this Author's Note in the New York Times Book Review, "Kwame Alexander on Children's Books and the Color of Characters." 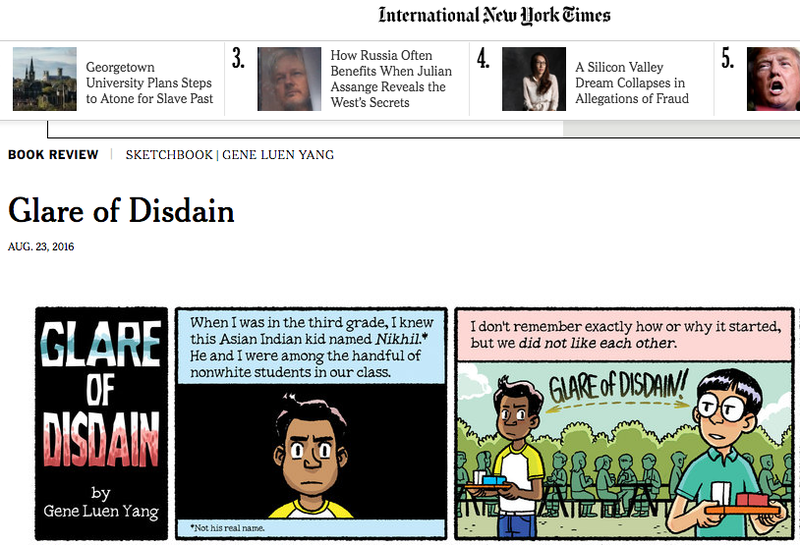 Gene Luen Yang's "Glare Of Disdain"
Check out the whole comic here. I hope it inspires you, too.